Our Summer Music Program looks a little different for 2018! Adult Choir Camp will be taking a hiatus from its traditional form this year. Instead, we are offering a different kind of program, based on ongoing requests. REGISTRATION DEADLINE MAY 31, 2018. ONLINE REGISTRATION NOW CLOSED. Are you a singer or musician aspiring to improve your music-reading skills? Would you like to understand more about the languages of notation, dynamics, rhythm, melody and harmony? If you’ve ever asked any of the questions below, register for this year’s Coastal Sounds Summer Music Program, developed just for you, based on your musical needs and experience. What does it mean to sight-read? What are those markings on the page? How does music-reading skill enhance learning and performance? In order to most effectively address each participant’s needs, we’re placing a cap of 15 registrants per section. If we near 15 people in both sections, we will consider a third section at a mutually agreeable time. Should your availability not match up with the above, feel free to let us know. While we can’t guarantee that we can accommodate classes outside of this schedule, we are willing to consider it if the need is there. The minimum registration for each section to go ahead is 5 people. The cost to participate is $75. This includes instruction, learning materials and a few extras. Have a question? Get in touch at info@coastalsounds.ca or find us on Facebook. Coastal Sounds Summer Music Program is proud to announce its fourth annual event! 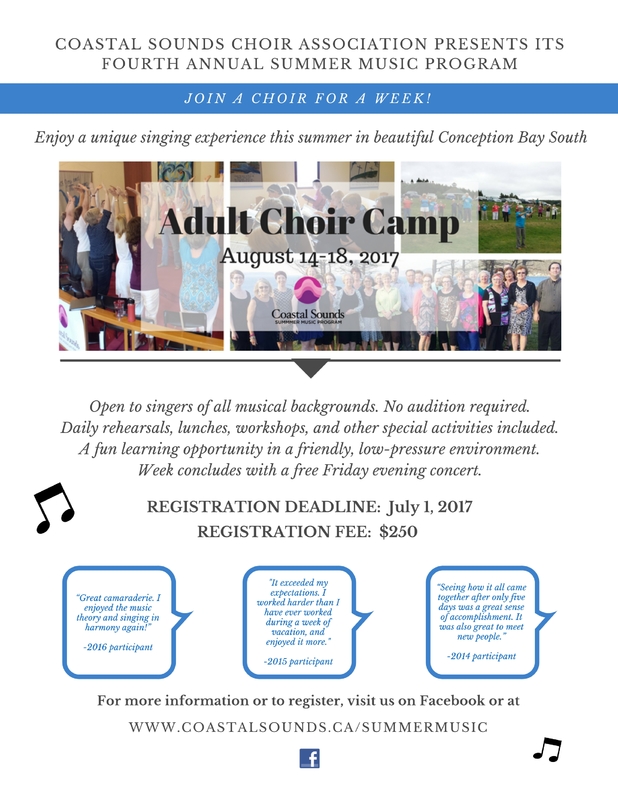 This year’s Adult Choir Camp will take place August 14-18, 2017 at Topsail United Church in Conception Bay South, NL. What is Adult Choir Camp? The Coastal Sounds Choir Association believes everyone can, and everyone deserves to sing! To that end, all interested adults are welcome to attend, regardless of experience level. Singing is one of the most intimate, enjoyable, and healthy things we can do for ourselves. Singing together in particular is simply an experience like no other. The beautiful backdrop of Conception Bay! View the 2016 Schedule so you can get an idea of how the week will run. This year’s schedule is currently being developed and will be posted soon. Is Adult Choir Camp for me? Do you love to sing, or do you want to get back into singing? Do you want to learn new techniques to improve your singing? Do you value or desire fellowship, friendship & community? Are you wondering whether choir is something you should try? Are you seeking MORE opportunities to sing in a choir? Are you unable to commit to a year-round rehearsal schedule? Are you from the area and looking for a stay-at-home vacation? Are you planning a trip to the area and looking to enhance your stay? Are you looking for a unique experience to share with a friend or family member? The 2017 deadline and fees are below. You may make payment by sending an e-mail transfer through your online banking to info@coastalsounds.ca or by cheque mailed to PO Box 20025 CBS Hwy, CBS, NL A1W 3L1. Please make cheques payable to Coastal Sounds, and indicate “Choir Camp” in the memo line. We’d love to hear them! Don’t hesitate to get in touch or find us on Facebook.